H2 is a rework tools that combined heat gun and soldering station perfectly. Not only does it operate simply and comfortable, but save room largely. 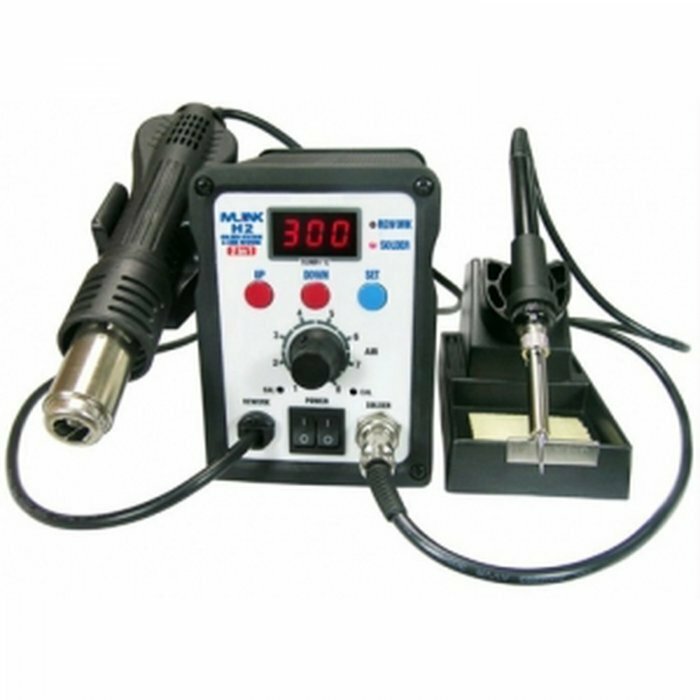 1.Multifunctional Integrated Desoldering Maintenance System Combined.by Rework Station and Soldering Station. 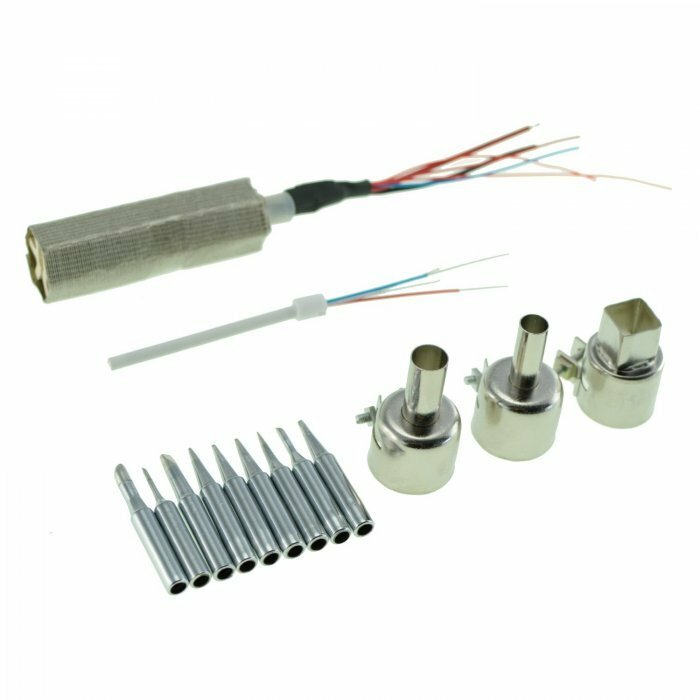 2.The core of the whole machine controlled by the single and microwave chip to make sure of temperature accuracy and stability of rework station and soldering station; not simply combined by the two equipments. 4.Temperatures of rework station and soldering station continuously adjusted by digital buttons to meet the needs in different workplaces. 5.The two stations can work separately. Using this device, you must abide by the following measures in order not to get an electric shock, result in damages to people or result in fire, etc. 1.In order to secure the safety of people, you must use the parts or accessories that the factory of origin certificates or recommends; or it will lead to serious aftermaths. 2.This rework station must be repaired by qualified technicians or the appointed person by us. 3.This device makes use of three-wire grounding plug, should plug it into three-hole grounding outlet. Do not change the outlet or ungrounded adapter which would lead to being bad ground. 4.be careful, for it is operated at a high temperature which is more than 400℃.Don't use it near flammable and explosive gas and objects, for the tip and the air from it are steaming-hot, which can burn people. Don't touch the heating element or spray the hot air against people. 5.When the hot air rework station starts to work, don't leave from your post. 7.Please keep the draughts of input and output expedites; there should be no block. 8.After using it, remember to cool the machine. You should put the handle into the handle frame. When the machine is in the waiting state, you can make the power off. 9.Do not use the iron tip to do anything except soldering. Do not make the iron beat table to Cleary the remains of flux, which will damage the iron badly. 10. When it was soldering, it will smoke. Please keep the work environment ventilation. Rousing the hot air rework.Under the waiting state, display does not show state neither of the two channel. LED display shows the working state of soldering station & SMD.rework and restores last time settings, as long as you hold the handle of the rework station again. Display “- -1” means the rework station partly does not start that the heating cord is off. Display“SLP”means the rework station enters the waiting mode. Display “- -2” means the soldering station partly does not start that the heating cord is off. Display “S-E” means there is something wrong with the sensor of the working channel, so the device stops outputting signal. Display “H-E” means the heating elements of the channel may be damaged partly. Bottom of the decimal point of the display: all are lighting which means heating; all snub out which means stopping heating; some is flicker means the temperature of one channel, at least, is stably.